TechSpot: How to Fix VMware Workstation 8 Installation Problem; Error 2732 Directory Manager not Initialized. 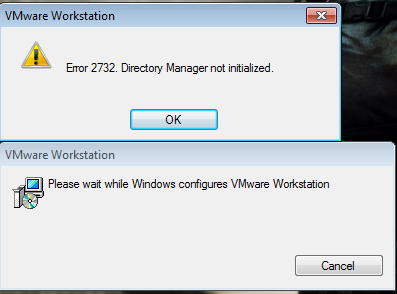 How to Fix VMware Workstation 8 Installation Problem; Error 2732 Directory Manager not Initialized. Hello Everyone, Here is one more post related to VMware. You might have faced 'Error 2732' error while trying to install new VMware version, VMware Workstation 8. I have downloaded VMware Workstation 8 trial version from VMware website and trying to install on Windows 7 desktop. Uninstalled old version of VMware Workstation. Error: 2732, Directory manager not initialized. Make sure you are installing VMware Workstation 8 on 64 bit hardware and Windows 7 OS. Try to install VMware as Administrator. You can right click on the set up file and select 'Run as Administrator'. Change 'Environmental Variables' on Windows 7 before installation starts. Change the entries for "TEMP" and "TMP" to "C:\Temp"
Now, change the Environment Variables to normal mode.